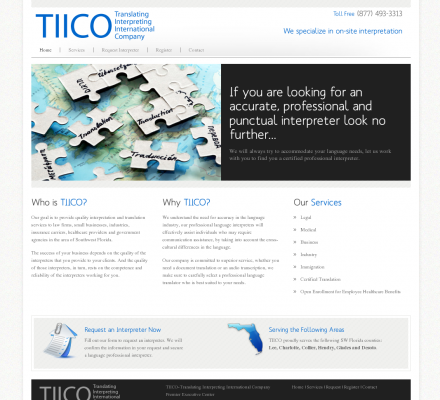 Our goal is to provide quality interpretation and translation services to law firms, small businesses, industries, insurance carriers, healthcare providers and government agencies in the area of Southwest Florida. We understand the need for accuracy in the language industry, our professional language interpreters will effectively assist individuals who may require communication assistance, by taking into account the cross-cultural differences in the language. Description: The success of your business depends on the quality of the interpreters that you provide to your clients. And the quality of those interpreters, in turn, rests on the competence and reliability of the interpreters working for you. Shaolin Translation (Popularity: ): Translation and interpretation in English, Italian, French and Chinese. Site in all four languages. Company based in China. Uta G Barth (Popularity: ): Conference interpreting, translation and voice overs in English and German. Freelancer based in Germany.